Note**They paid over $2.3 million for a foal born March 8th, 2013. I'm not familiar with yearling sales and have never watched or attended one. 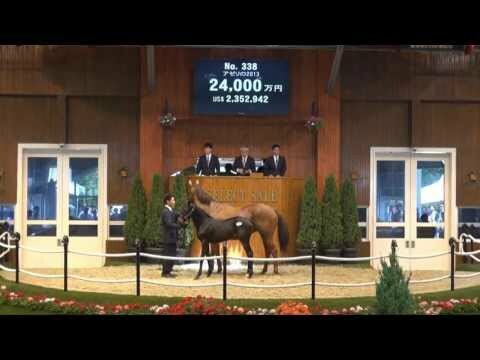 But it is Interesting that in Japan, they showed, what I assume was the mare with her foal during the auction proceeds. I assume the foal was a yearling and already weaned? No the foal will be weaned shortly it seems by the age it looks. Normally when a mare is with foal and the foal is being sold it will go in with its mom. If the foal was weaned it would be in the sales by itself. Same with if a mare is being sold but is with foal it would be like a 2 for one deal, u buy the mare and the foal tags along lol. Thats how it is in america, not sure about japan. Not necessarily Rachel, Vertegineux was sold in foal with Ebbie, but Eric Kronfeld got to keep her. It depends on what is agreed to in sale contract. Pati posted this video of the Deep Impact colt in the sale's ring with mom on the blog. They are both gorgeous! I've heard of '3-in-one' deals too, where mare (pregnant) and foal at side are all for sale. yup, sometimes when a mare is pregnant at those sales she will end up giving birth in the stalls and the next day when shes going in the sales she will have her new born foal with her in the sales ring. this happend with a well known mare recently in the november sales at keeneland i believe. she had a Distorted Humor colt. Did you notice Azeri dancing and the baby copying her? So cute!
" Man o' War; 1 Optimizer 2 Speaking of Which 3 Folk Singer 4 Twilight Eclipse 5 Finnegans Wake 6 Boisterous 7 Al Khali 8 Exclusive Strike***"
When and where will this be run? I believe Deputy Striker is based on the west coast anyway. Yeah but speaking of Deputy Striker does anyone know of his next race plans? Royalty a full sister to Summer Bird makes her debut Saturday race 8 at Monmouth. Is entered in Race 5 at Delaware Park on Sunday. I'm not sure they are even racing on Sunday. I don't see it in Equibase either. I'll see if I can find out where the person that posted it got the info.